Teppo Hauta-aho, Mikko Innanen, Kalle Kalima and Veli Kujala. 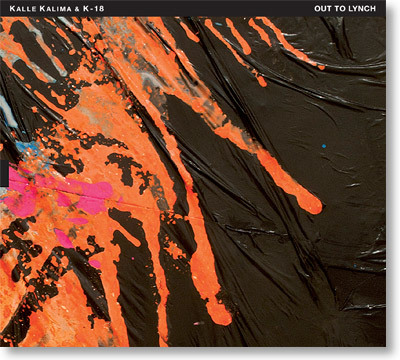 On their second release, Kalle Kalima & K-18 continue to present composer and guitarist Kalle Kalima´s aural impressions of the world of movies. Whereas their first album (Some Kubricks of Blood, TUM CD 022) included Kalima´s compositions inspired by Stanley Kubrick´s films, Out to Lynch presents his reflections on some of director David Lynch´s key movies, such as Blue Velvet, Eraserhead, Lost Highway, Mulholland Drive, The Elephant Man, Twin Peaks and Wild at Heart. With this recording, Berlin-based Kalle Kalima, who is best known for his work with three different trios (Klima Kalima, Johnny La Marama and Momentum Impakto), his solo project Kalle Kalima Pentasonic and his collaborations with the likes of Marc Ducret, Linda Sharrock, Sirone, Tomasz Stanko, Simon Stockhausen and Jimi Tenor, has created another unique album that is rich in sonic colors and constantly alternating moods. Featured with K-18 are again saxophonist Mikko Innanen, bassist Teppo Hauta-aho and accordionist Veli Kujala, each an acknowledged master of his chosen instrument. The quartet's uncompromising approach to improvisation combines elements from free jazz, modern classical music and even avant-garde rock that prove particularly well suited for these reflections on the world of David Lynch.